Urban Regeneration Companies (URCs) are organisations that combine the economic and political interests of the private sector and the local state; they are established by national governments but are run at ‘arms-length’ from the elected powers that first incorporated them. As such, URCs reflect a general shift in British politics that began in the mid 1970s. This period saw rapid de-industrialisation of the economy, and consequently the move away from a redistributive, cohesion-oriented, centralised form of state led capitalism and towards a more entrepreneurial ethos. Local and national government now enhance and enable the position of corporate capital, allowing private business interests to participate in both the ideological direction and the day-to-day activities of governing society and space. Glasgow’s East End is being re-shaped according to the needs of capital investment. A key consequence for residents is that their sense of belonging and security is no longer prioritised, despite the promotion of Clyde Gateway as a community oriented organisation. This tension becomes apparent in the words of jubilant local councillors and MSPs following Clyde Gateway’s incorporation in December2007. 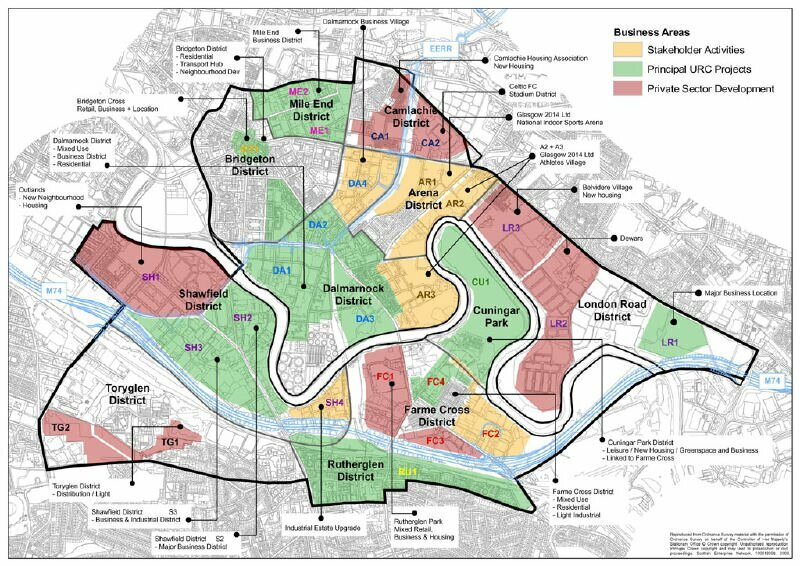 At one and the same time Clyde Gateway is described as being “all about people…bringing about genuine regeneration…enhancing life chances..bringing substantial social and economic benefits for thousands of people”. It is also described as “wholescale[sic] transformation of the area…removing barriers to market opportunities and securing major private sector investment”. “The emphasis of Scottish URCs is on their “catalytic” abilities.The Companies are expected to deliver outcomes across economic, social and environmental as well as physical regeneration”. In other words, they are set up to facilitate business development through urban redevelopment. Shawfield and Rutherglen in South Lanarkshire. A registered charity, limitedby guarantee”. “create 21,000 new jobs, construct 10,000 new homes, increase the population by 20,000 and deliver £1.5 billion of private sector investment”. However, upon closer examination of their annual financial statements, the organisation appears to operate on a rolling basis of two to three years. In 2009, the financial statement refers to “agreeing a three year operating plan”.In 2012, Clyde Gateway Developments Limited reflects on the confirmation of funding from the Scottish Government and their accumulated reserves, and suggest “the directors have a reasonable expectation that Clyde Gateway Developments Limited has sufficient resources to continue its regeneration activities during this two year period”. With no long term planning onthe table,we would say it is more a question of ‘if’ these homes are built. Furthermore,there is no indication by Clyde Gateway that long-term planning for Social Housing is a priority for them. While the Commonwealth Games is related to the Clyde Gateway project, they are not the same thing. Initially 1,400 homes were promised for the Games Village, but this has been revised downwards. 700 houses are being built in the “first phase”, and one manager at Clyde Gateway has said he “can’t say when the second phase will even begin, far less completed”. City Legacy have recently told us that the first phase will create 400 socially rented houses and 300 for private sale, and that “Phase 2 will not commence until sales of the 300 units are well underway”. In other words, this is a market-led programme of public subsidy and there is no guarantee that it will pay off–it is a gamble.We made enquiries in January 2013 about a revised figure for housing units to be built under Clyde Gateway’s tenure, and again in October, and the answer both times was that the housing targets were being looked at, and no figure has been forthcoming. In their 2012-13 Annual Report, Clyde Gateway suggested that by 31st March 2013 a total of 1189 housing units had been constructed. This number includes private housing. are asking local and national governments to compare the amount of public subsidy received by Clyde Gateway with the paltry figures of new homes built during their time and ask: when are they going to take the housing crisis seriously? Public bodies have so far given Clyde Gateway over £163million in grants. The company is planned to continue until 2028, which means that if investment rates remain at a similar level, not factoring in inflation, we can expect this total to rise to well over £500million. Yet housing in itself is simply not a priority, and the housing that is being built is predominantly for private ownership. We might speculate that the type of regeneration delivered by Clyde Gateway is less about “ enhancing life chances…bringing substantial social and economic benefits for thousands of people” and more about bringing people into the debt economy through mortgage repayments and unaffordable market rate rents. Games Monitor will be looking in more detail at Housing Associations in another primer, given that Housing Associations in their scale and rationale increasingly resemble market-driven private entities. We also know that Glasgow City Council has spent public money on what it calls“land preparation” in Dalmarnock and Rutherglen whereby the public purse is used to cover the massive cost of cleaning some of the most polluted land in Glasgow, in order that it is ready for private land developers to go in and start building business premises. This is a well- known process of‘ public pain, private gain’– a socialisation of risk, and privatisation of profit. Local and national governments now share the dogma of the private sector; the rationale behind decision-making is to monetise as much space in as little time as possible. This means opening up housing to market interests, reducing the availability of social housing, and pushing people into the private sector, where they are forced to increase their personal debt. This allows the international financial system the leverage to acquire more and more capital and take increasingly risky actions in doing so. This logic brought about the Subprime Mortgage Crisis in America. In the wake of the financial crisis which started as a result, we have seen austerity measures across Europe which have created poverty and despairfor millions of people. Clyde Gateway has received £163 million of public funds (to 2013), and the Commonwealth Games is costing £523 million(see primer# 6 in this booklet).Where is the commitment to the social necessity of Housing? It is time residents were able,not only to challenge decision makers on these processes, but to plan and claim material ownership over their communities. Alternatives to market-led housing exist in Britain. Housing cooperatives and Community Land Trusts have been the legacy of anti-gentrification campaigns. These gains are hard won through the actions of well-organised, tenacious residents groups who have an independent voice from local government and the organisations setup by local government to represent communities. It is also important to add here that the pervasive narrative put forward that Dalmarnock was, prior to the Clyde Gateway’s intervention ‘derelict land’, in fact it was the site of community of people,there were residential properties,a GP surgery,shops and the only day facility in the East End for people with additional support needs and their carers to seek respite.This was the site of key services in the community which were compulsory purchased, demolished andnow liederelict ortarmacked over. Below is a breakdown of the capital grant funding Clyde Gateway has received from different public authorities since 2007,as published in their own annual reports. The Clyde Gateway website suggests that public money will “pave the way for a further £1.5 billion in private development over the next two decades”. Number of housing units newly built or acquired in Clyde Gateway’s area to March 2014 since Clyde Gateway started in December 2007. Unless otherwise stated, these are figures provided by Clyde Gateway in email correspondence with Games Monitor. The figures have not been independently verified. Games Monitor and Clyde Gateway are not in agreement over the exact figure.